The Innu, formerly known as the Naskapi-Montagnais Indians, are an Algonkian-speaking people whose homeland (Nitassinan) is the eastern portion of the Quebec-Labrador peninsula. The word "Innu" means "human being", and the Innu language is called "Innu-aimun". Today there are over 16,000 Innu who live in eleven communities in Quebec and two in Labrador. 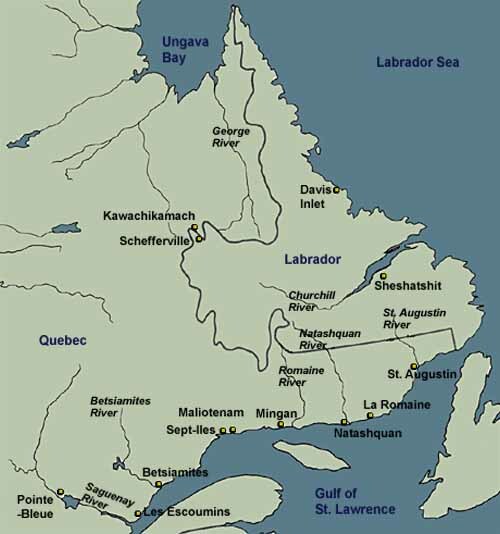 The two Labrador communities are Sheshatshiu, where Grand Lake (Kakatshu-utshishtun) meets Lake Melville (Atatshuinipeku), and Davis Inlet (Utshimassit) on an island off the north coast of Labrador. The population of Sheshatshiu is about 1,000 while Utshimassit's is about 500. 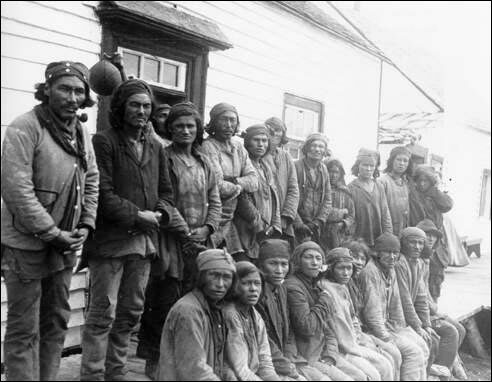 An early 20th century photograph of Innu traders gathered outside the Hudson's Bay Company post in Davis Inlet, Labrador. Courtesy of the William Brooks Cabot collection, 1903-89. ©National Anthropological Archives, National Museum of Natural History, Smithsonian Institution, Washington, D.C. Together, the two communities form the Innu Nation which represents the Innu people of Labrador to the wider world. Before the 19th century, Europeans had little adverse effect on the life of the Innu of northern Labrador. The Innu lived in small bands with an intimate knowledge of a huge area of the Quebec-Labrador peninsula. They lived in skin tents and were highly dependent upon the caribou for much of their food and clothing. Adapted with permission from Peter Armitage, The Innu (The Montagnais-Naskapi) (New York: Chelsea House Publishers, ©1991) 30. Courtesy of Gary Tong. Adapted by Tina Riche, 1997. The arrival of European trading posts in Labrador and northernQuébec in the 19th century and the subsequent attempts to drawthe Innu into a dependency on European trade goods heralded anera of great change, much of it harmful. The late 19th and early20th century were marked by increasing competition from white andsettler fur trappers, particularly in central Labrador. The collapse in fur prices in the 1930s and the reduction in the size of the caribou herds caused great suffering among the Innu. 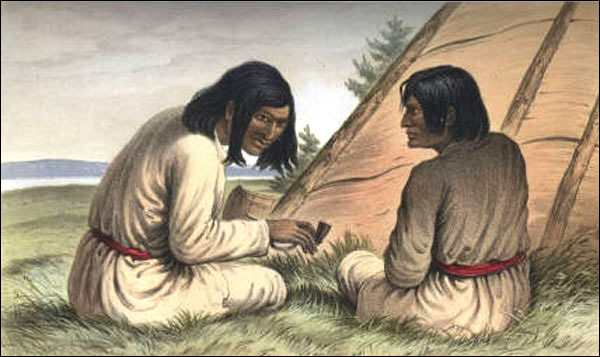 The drawing was titled "Nasquapees"
Drawn by W. G. R. Hind, chromolithographed by Hanhard. From Henry Youle Hind, Explorations in the Interior of the Labrador Peninsula: The Country of the Montagnais and Nasquapee Indians, Vol. 2 (London: Longman, Green, Longman, Roberts, and Green, 1863) 96. Death and suffering from European diseases; the building of mining towns (Labrador City, Wabush and Schefferville); the growing population of non-Aboriginal people; the imposition of provincial government hunting regulations; the settlement of the Barren-ground Innu at Davis Inlet in the late 1960s; the flooding of a huge area of productive Innu land by the Smallwood Reservoir in 1970; and the expansion of NATO military flights over Innu territory in the early 1980s did much to erode the Innu land base and promote culture collapse and its associated social pathologies. Despite these assaults on their culture many Innu retain much of their traditional relationship with the land and its animals. The Innu are negotiating for recognition of their aboriginal rights to their traditional territory and struggling to heal the ravages of years of village life. Adapted with permission from Peter Armitage, The Innu (The Montagnais-Naskapi) (New York: Chelsea House Publishers, ©1991) 91. Courtesy of Gary Tong. Adapted by Tina Riche, 1997.